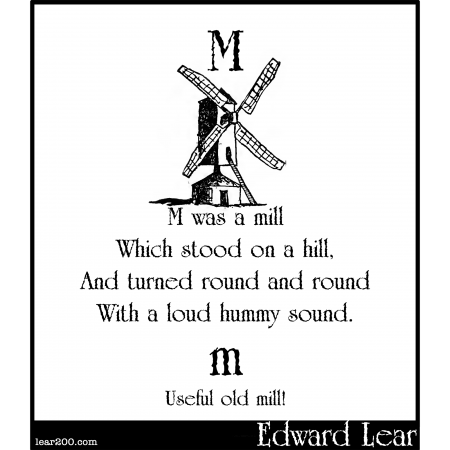 M was a mill | Edward Lear: Two Hundred Years of Nonsense! With a loud hummy sound. Mouse over Foss to rate this! Click to Rate This on Our FOSS SCALE! Get This on a T-SHIRT! Check Out Our ZAZZLE STORE for Your Favorite Lear Designs! All of the drawings and stories on this website are well over 100 years old, with some fast approaching the 200 year mark. It should be remembered that such items are an important resource in the study of contemporary and past cultures. We feel is more important to display them honestly for what they are, rather than censoring certain items and pretending some prejudices did not exist.